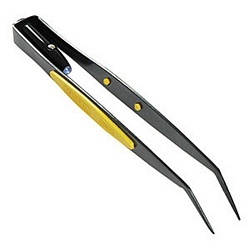 For installers working in dark, confined spaces, the Lighted Tweezers are perfect for placing or retrieving small parts, pulling elusive cables and many other delicate operations. A built-in bright white LED directly illuminates your working area. With its angled tip and serrated edges, the Lighted Tweezers also gives you greater leverage and improved grip for pulling jumpers, fuses, even network cables. Requires three LR41 batteries, included. Pros: Accurate, firm pickup of objects, and of course, the LED light which is focused onto the grasping tip area. These are incredibly useful for dark server cases where small parts, wires, and other elusive bits need to be pulled, probed, or picked up once dropped. Other Thoughts: I love em! Great addition to my server/workstation repair/maintenance kit. Definitely would recommend these to computer hardware people, electronics and other hobbyists. 10 out of 17 find this review helpful.